In our last exciting episode back in September, Comet ISON was just about to cross the orbit of Mars and enter the inner solar system for the first time in its existence. With every passing day, ISON draws closer to the sun, accelerating ever fast on the "downhill" plunge of its solar-coaster ride. This week ISON has passed the orbit of Venus, and things really seem to be heating up. There's been a great deal of anticipation surrounding this particular comet, which was discovered last year by a telescope in the International Sky Observer Network—and a great deal of debate about whether it will become a "Comet of the Century", or fizzle out like so many other comets of the century have in the past. The crux of the arguments of both camps—the cautiously optimistic and cautiously pessimistic crowds alike—is how close to the sun ISON will get on November 28th: a scorching perihelion distance of only about 700,000 miles from the sun's surface, or less than one solar diameter. Will it or won't it? Will it survive the intense radiation and gravitational tidal forces of its sun-grazing trajectory or break apart and vaporize? If it survives, will the heating it receives during its flyby pump up its gaseous coma and tail to highly visible proportions? Even now, before perihelion, ISON has produced a sizeable tail. It has been spotted through binoculars in the early morning skies, within the constellation Virgo. This bodes well for a showy performance as the weeks go on—though doesn't guarantee anything; comets never come with guarantees. 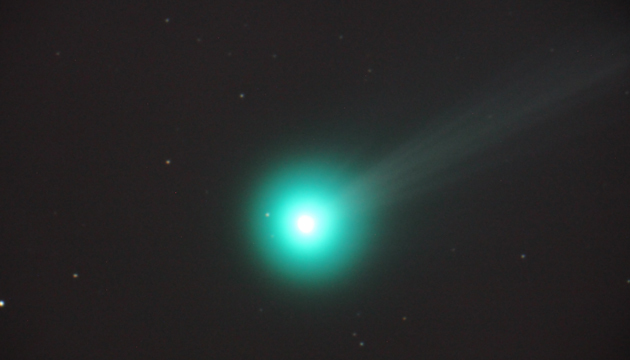 Comet ISON is of a class of "sun-grazing" comets that likely originate far out in space in the Oort Cloud, an expansive shell of material that surrounds our solar system and extends perhaps a light year into interstellar space. When the solar system formed from the protosolar nebula—its "birth cloud" of gas and dust—almost 5 billion years ago, most of the material condensed at the center, forming the sun and the planets of the inner and outer solar system. As the sun and planets "snowballed" into larger and more massive bodies, they dominated the space around them, sweeping up the remaining gas, dust, and rock and ice chunks with their gravity. When the sun lit into an active star, its heat vaporized much of the ices near it. But at greater distances from the sun and planets the effects of their gravity and the sun's radiation drops off, leaving objects in the realm of the Oort Cloud more or less unaltered. The Oort Cloud consists of perhaps billions of icy objects--planetesimals and comets—that are mostly in the same condition they were billions of years ago. These frozen bits constitute "fossils" of a sort, buried in the deep dark reaches where the sun appears merely as a bright star. Billions of tiny time capsules, they preserve information about the earliest times of the solar system's formation. Occasionally one is dislodged, perhaps by the gravity of another passing object, and sent falling toward the sun, like ISON. Some time in the distant past ISON's orbit in the Oort Cloud was disturbed, and it has spent the entire time since then falling toward the sun, carrying its cargo of information from the earliest times of the solar system with it. Now, for an exceedingly brief time, ISON is in the sunlight, its ancient ices vaporizing and lighting up in all a comet tail's glory. Then, assuming it survives that defining moment of perihelion, ISON will begin the long coasting climb back toward the Oort Cloud, maybe never to return. I hope you can catch a glimpse….